/ The Wedding’s Over – What Now? The Wedding’s Over – What Now? The top tier of the wedding cake has been safely stored in the freezer, awaiting the first anniversary celebration ritual. The wedding dress has been carefully preserved and packed away. Duplicate gifts have been exchanged and thank you notes have been written. 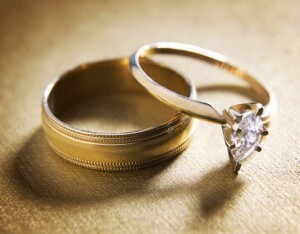 You wake up next to the person you have promised to love “’til death do you part” and wonder, what now? As children, we develop vivid dreams of our perfect wedding day and read again and again the story of the princess and the prince who “live happily ever after.” As adults, we realize “ever after” is a very long time and wonder if it can only happen in a fairy tale. Your mother talks about your “wifely duty” and keeping a clean house. Your dad talks about providing for your family. Your married friends tell you all the awful things that are wrong with their marriage and your single friends just smile. One important key to developing a strong marriage is recognizing, building on and adding to the strengths that already exist in the relationship. A marriage isn’t stagnant – it’s a vital, growing, living thing that requires attention and has great potential for growth. We believe that the quality of our relationship and our marital satisfaction lie in our own hands. Early in our relationship, after the honeymoon, we made a commitment to educate ourselves in ways that would empower us to develop a strong, healthy marriage. We attended a retreat for couples our first year of marriage. We learned communication skills, creative conflict management, and the importance of spending time every day sharing with each other our thoughts, feelings, hopes, dreams and fears. That event gave us important skills that we continue to use in our relationship after 33 years of marriage. We also joined an ongoing small group of couples, all who were committed to developing a strong, healthy, satisfying marriage. As couples, we learned to trust each other and to share openly with each other about our struggles. What a relief to know we weren’t alone! schedule a weekly date night – write it on the calendar in ink! schedule a monthly getaway for a day or a weekend – keep the adventure and fun alive! Now that the wedding’s over, it’s time to focus on the relationship, answer the ‘what now?’ question, and learn to live happily ever after!